When you think of football's golden era of smash-mouth football during the 1960s, one name often comes to mind -- Jim Brown. An unbelievably gifted athlete, his dominating presence on the field helped bring a new audience to the sport. Jim Brown football and autographed memorabilia have long been cherished collectibles for both casual fans and die-hards. 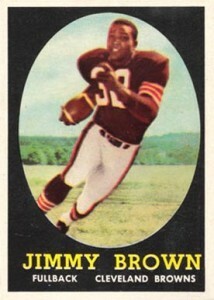 The lone Jim Brown rookie card comes from the 1958 Topps Football set. Brown also had a food issue release as part of the 1958 Carling Beer set. His first autographed card would come some 34 years later as part of the little-known 1992 All-World Football. The card is serial numbered to 1,000 and is fairly difficult to find. 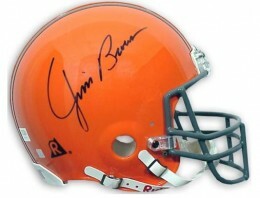 One of the most popular Jim Brown autograph cards, however, comes from the classic 1997 Upper Deck Legends Football. He signed 100 Sign of the Times cards and an undisclosed number of the base parallels cards. Jim Brown's first memorabilia card was also produced by Upper Deck, coming two years later in 1999 Upper Deck Century Legends Football. 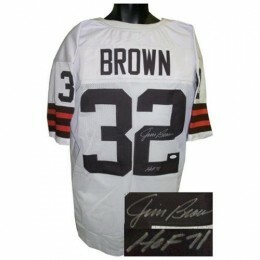 Jim Brown's longevity and very frequent public autograph appearances have kept a steady supply of material in the market. His crossover to movies in later years helped reinvigorate demand for his signed memorabilia. While his autograph will always have value, it is pieces from his playing days that command top dollar. 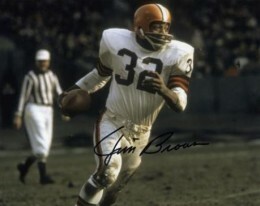 The black oval framed image of Jim Brown posed in an action running shot without his helmet is a classic. The oval gives one a sense that they are taking a peek behind the curtain of life in the NFL. The yellow and white text provides a striking contrast to the black frame and provides all the necessary detail without infringing on the overall design or player image. JIM BROWN 1999 DONRUSS GRIDIRON KINGS AUTO AUTOGRAPH CARD #107 1000!! JIM BROWN 03 UD SP SIGNATURE AUTO AUTOGRAPH CARD!! 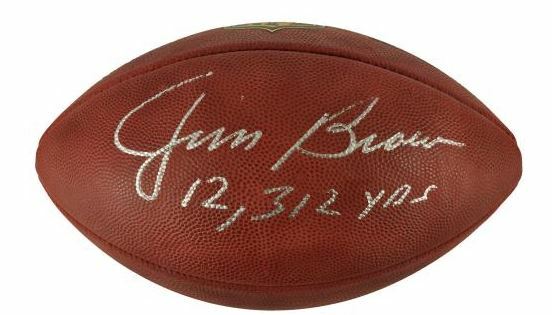 Below you will find examples of what an authentic Jim Brown autograph looks like. This can be used as a first point of reference for determining the legitimacy of autograph memorabilia, but is not a substitute for having your items authenticated by a well-respected professional autograph authentication company. Some of the trusted sources within the sports memorabilia market include the following companies: PSA, JSA, Steiner, Tristar and Mounted Memories. Click on any of the images below to view full size photos. The use of cursive script provides a distinct look. The defining characters are the "J" which consists of a larger oval shaped loop at the top, which is usually closed but not always and a smaller elongated loop on the bottom at about a 45-degree angle. The "i" is formed by an up/down stroke that often creates an upside down "v" and the humps of the "m" are pointed, the "i" is dotted but haphazardly. The "B" is written on an angle of about 45 degrees and is formed so neither of the bulges are closed, the pen makes a small loop to stay on the item and flow into the "r."
The "o" is discernible but closed, but the 'w" is very legible. The signature finishes with a discernible "n" and often a trailing horizontal line. Rare Jim Brown Signed Jim Thorpe First Day Cover FDC JSA Cert. Rare 1992 All World JIM BROWN Cleveland Browns Insert Autograph Card * Mint!